Lu grew up in a small city in Iowa, the youngest of five kids. Her parents both worked in the food processing industries, Mom for a dairy and later a cafeteria manager, and her dad for Pepperidge Farms. Surrounded by lush farms and corn fields, the family grew many of their own vegetables, and canned or froze the excess. Lu was her mom’s assistant in the kitchen and later, after her dad’s death, she shared cooking duties with her older sister, while Mom was working. Lu never set out to get into the food business, and focused on music, writing and, at times, acting as a career plan. After high school she spent several years working as a professional musician in Iowa, Nashville, and Austin, Texas. After a divorce in 1992, Lu put away her microphone to focus on raising her two kids. She then stepped into the high-tech world, where at her workplace, she got the reputation as a great cook, bringing in goodies for potlucks and other events. 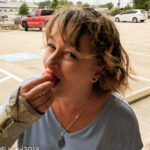 In 2005, she followed her food passion and worked briefly at a gourmet grocery store, until chronic pain from nerve damage made it difficult to continue. After multiple surgeries to correct the problems, Lu enrolled in the Culinary Arts degree program at Austin Community College in 2008. While attending ACC, Lu worked as the assistant to the Culinary Arts Department Chair. There, she assisted with new student advising, worked as a teaching assistant in the student-run lunch bistro, developed the menu for the lunch bistro, ran a weekly tutoring lab teaching knife skills and basic professional restaurant skills, coordinated catering and student volunteers for both private and public events. As a student at Austin Community College, Lu assisted with preparations and coordination of the annual Sunday Fair. Privileged to have worked with well-regarded and well-known chefs to coordinate their demonstrations, she set the demonstrations and assisted during their presentations. Chefs included David Bull, and John Besh. As part of the coordination, she standardized recipes to serve 700 plates, and worked with Whole Foods and other purveyors to obtain the needed ingredients. Additionally, Lu assisted with preparation and coordination of other various events including Fall Creek Vineyards Annual Grape Stomp 2009 and 2010, Austin Community College’s 35th Anniversary and worked catering private events. Lu has much of what she does available at www.evolutionaryeats.com. Evolutionary Eats includes photos, tips and tricks, a downloadable shopping list, recipes and more. Lu adds to the website on a regular basis so check back often. You can also learn much of what Lu teaches her clients on her YouTube channel, Lu4evolutionaryeats. Lu currently works as a beer and wine sales specialist and the best grocery chain in Texas, HEB. Along with handing out samples of phenomenal wine or hunting down that perfect bottle of Cabernet, she assists with teaching classes at the store every few months. Her vast food and beverage knowledge has lead to a reputation of knowing where everything is located and how to use everything. In addition Lu continues to bake for her gluten sensitive clients. Suffering from a wheat allergy, Lu says her products are “entirely selfish” and fulfill her desire for baked goodies. A permanent kitchen for Evolutionary Eats is in the works, and will assist up and coming food businesses with a sustainable, fully equipped commercial kitchen. She currently lives in Austin, Texas with her two cats, Buzz and Domino.